Y’all I survived the fall semester. I am so proud of myself and all my classmates because it was a challenging semester. After 8 Exams, I will be honest that I definitely shed a few tears along the way. I think the hardest part of this semester was really figuring out the best way to study because as most people say med school is like drinking from a fire hose which is the most accurate analogy to describe how I felt. At the beginning of the year, I bought an IPad, and it changed my life… no more paper for me. For this blog post, I just want to highlight some key aspects of the semester from academic to personal life. Coming into the semester, I’ll be honest I was a bit hesitant because I was a psychology major in undergrad and never took a genetic, immunology, or microbiology class in my life, so I didn’t know what to expect. Our genetics and immuno professors were amazing and made it so easy to understand the material. I can honestly say genetics was by far my favorite course this semester and immuno and micro were not too far. Pharmacology was straight up memorization which isn’t my favorite because I prefer conceptual learning than rote memorization. I soon figured out ways to memorize large amounts of information in a short amount of time and all I can say is sketchy is my best friend especially for microbiology. For those of you that don’t know I attend an osteopathic medical school (DO) so we take an extra course called OMM where we learn to use our hands to diagnose and treat disease. I was excited for this class because you could instantly see the improvement in the person being treated. My classmates and I quickly got close to each other. And during the break, I went home and tried OMM on my family but they weren’t too keen on me cracking their backs lol. Lastly, another class we took is called OSC which is the “doctoring” class where we learn to do a physical exam and take a history. I loved this class because it reminded me of why I am doing this and made me excited to one day work with real patients. For the spring semester, we start our systems courses where we focus on one specific system and learn pretty much everything about that system. I will let you all know how it goes and keeps me in your prayers. Notability for IPad is the best thing ever. Sketchy - I wanna hug the narrator and just thank him personally because he made me get through micro and pharm. Large white board - It’s not necessary but I like to use it to test myself when memorizing stuff. Books - none expect First Aid USMLE STEP 1 for time to time but really never used any books. I just focused on the material in our course packets and if I needed clarification I can always search it or ask a professor. My school also has books online for us but really never needed it. First Aid was helpful for micro and pharm for mnemonics or helpful charts. Alright lets get to the Personal ishhh…. I remember as a pre-med being so curious on whether med students had social lives and now I can tell you we definitely do. And med students definitely know how to have a good time. But, you really do study every day, so you have to literally schedule time in to be social even if you don’t want to. Also forming a good study group is key because studying alone can be isolating at times so its a nice break from studying…even though you’re still studying. I was fortunate enough to make some amazing friends who I can struggle with and also grow with. Having a good support system both in med school and outside is so necessary. Living away from home, I Facetime my family on a daily, maybe a bit too much. I also go home during the breaks and when I’m home, I make sure I am living in the moment and not thinking about school at all. My mental health has had its ups and downs throughout the semester. During the difficult times, I am so thankful for my family, especially my sisters for listening to me complain about how much I had to do. Also, my med school has great mental health services with a therapist, and I utilized this service many times because there is something about talking to a stranger about my issues that makes me feel like a weight has been lifted from my shoulders. If you’re a student, please get your money’s worth and utilize the mental health services at your school because it's usually free and why not talk to someone about your problems? We all have mental health issues, and there is nothing wrong with talking to someone. Okay, this was a pretty long post, and there is still more I want to say, but I’ll end it here. If you have any questions, you can always contact me. As always just know that anyone can do anything it's all about your mindset and how dedicated you are in achieving your goal. If you are in the medical school application process, you’re probably in the interview process now. And all I can say is I feel you! but the wait is so so worth it. Interviews can be stressful or fun depending on the environment. I remember being so anxious before my first interview last year in September. I arrived in a new state the day before, not knowing anyone or even the location of the school. Luckily, the interviewers and the fellow students were super kind and understanding. Its expensive, so save your coins. you’ll wait for months before a response, so be patient. a rejection isn’t the worst. rejection hurts but use it as an opportunity to grow rather than seeing it as a failure. Now on to the outfit. This was the first time I had to wear professional attire and I was shocked to find out how freaking hard it is to find a suit. Maybe I'm just picky but finding a suit that wasn't too short or too long and fit perfectly was pretty much impossible. The fashion designer in me was eager design and sew my own suit and that I did. For the design I went for a long pencil skirt and a peplum suit jacket. The skirt was pretty simple as I've made it before but the jacket was a bit tricky. After creating my pattern I slowly put the pieces together. I was happy with the final look! I always feel at my best when I’m wearing something I designed because I know the fit and style is just right. You might be wondering if I actually wore it to my interviews and the answer is YES! I wore it to one of my med school interviews and most importantly I was comfortable, which is what I was striving for during a high-stakes environment. Hopefully that was insightful! As always send me your questions or comment below. I want to begin by congratulating everyone who started their semester today! Even though my medical school started in the summer, today still felt like my first official day. As my first lecture of day began I realized how much of a nerd I really am because I genuinely enjoyed it but thats not to say I understood it (lol). I know this semester will come with many challenges, but I have faith that I will get through it because I am here for a reason and so are all of you. I want to share my goals for this fall semester with you all and maybe check back later to see how it went. 1. Strengthen my relationship with God. I believe our faith plays a protective role in maintaining our mental wellbeing. 2. Meditate or Do Yoga more often. I try to do this now but not as much as I want to. So we'll see what happens! If you have any Yoga/Meditation tips send it my way! 3. Don't compare myself to my class mates. I know I'm smart, but we all have moments of weakness and I hope I can recognize it and get myself out of it. 4. Take care of my body. I feel like I say this all the time when a new semester or year begins but I want to work on establishing a more regular workout routine and eat healthier. I guess we'll see what happens. 5. Be kind to myself. This isn't to say that i'm mean to myself rather I want to make a more conscious effort to show compassion to myself and not be so rigid. Being in a high-stress environment like med school, you can forget to be kind to yourself with all the pressure of doing well on your shoulders. 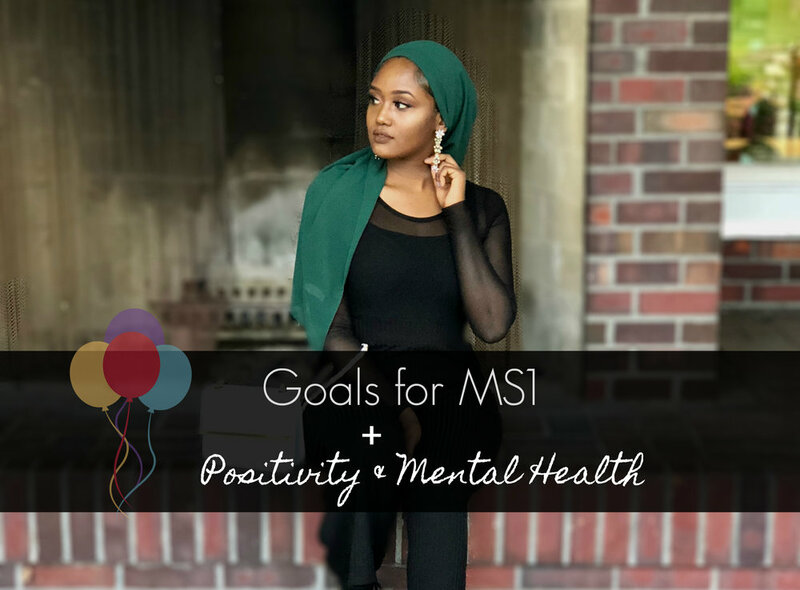 All of my goals revolve around the mind, body, and spirit, which is the philosophy that my medical school as an osteopathic medical school follows. In order to be a great physician, you need to attend to yourself before caring for another human being. Physician and medical student burnout and suicide is real. That is the very reason as future healthcare professionals, we need to take care of our mind, body, and spirit as much as you care for you grades. Best of luck this semester! The application process was brutal, well I thought so. It was an emotional rollercoaster from waiting for secondaries to waiting for an interview invite to eventually waiting to hear back on whether you were accepted, rejected, or waitlisted. It really messes up your psyche. I began this journey with a plan carefully laid out for myself and during my application cycle I learned the hard way that the plan I had for myself was destined for an edit. In the beginning I was distraught when I got waitlisted and later rejected from my first choice. I remember thinking that I had failed myself and even my family. As dramatic as that my seem, I had a vision for myself and I didn't seem to achieve what I thought I needed. I kept fixating on what I didn't have and ignored the two acceptance I already had before me. During this time I spoke to a mentor of mine, who is a physician that I admire so greatly. Having someone to share my frustrations with and who understood the process was tremendously helpful. I remember calling him and telling him that I got accepted to his alma mater when he said "how does it feel to be a medical student now!" mind you I didn't actually start med school yet, but just hearing him say that I immediately felt this rush of excitement like "wow" your girl finally did it. Looking back to where I was in the beginning of the cycle and to where I am now, I can tell that this process has changed me for the better. It strengthened me spiritually, because it showed me that God had a better plan for me than I could have ever imagined. This journey is not a walk in the park as many of you may already know, but it is achievable and worth it in the end. Self-care is crucial during this time, no matter what happens take care of your mind and treasure your sanity. You might not get your plan A and your plan A might not be the best for you, so keep an open mind and have faith that there is a higher power looking out for you. 3. Chill your going to be DOCTOR! Medicine is not a race. If you want to be a doctor, you will get there. If you want to know the details of applying to med school like what needs to be in the application and things like that let me know and I will do a post on that! It's been nearly 2 months since I started med school which is surreal. Thinking back where I was a year ago...I remember how bright eyed and eager I was to start. My journey to where I am today has been filled with many ups and downs. Being the first one in my family to enter med school, I am filled with gratitude. I could not have gotten here without their unconditional love and support. Getting into med school is an uphill battle (for most people) and I was blessed to have people behind me pushing me to achieve my goal. No one can do this alone, which is why I decided to blog about my journey. I will be transparent as I can about what I did to get here and all the things that I wish I could have done better. I hope we can connect and many inspire you to join this path because we need more black women in medicine and I am excited to become one. Imposter syndrome is real: being in a concentrated environment where everyone is aiming for the same goal, and is very WHITE....you often question your worth. Thinking whether or not I deserve to be here? That might seem harsh, but that is the reality, and it was for me during the first week. However, once I got the hang of things, I held my ground. Because I knew all classes I struggled through in undergrad, extracurriculars, and hours of shadowing I did to be here was for a reason and I sure as hell deserved to be here. I'm actually smart: I don't mean to sound arrogant or boastful. I'm the type of person who always questions her ability, which is not healthy, but I do it. And coming in I had this irrational fear of failing my first exam. This probably ties in with the imposter syndrome because before med school you hear people tell you how difficult it is, which is true, but what you don't hear too often is that its doable. You got time: I remember in undergrad I was paired up with a first year med student and the first thing I asked her was "do you have a life? ", hopefully not in a negative way. I was so curious about how med students have time outside of school. Time is precious and in med school you want to be very diligent in how you use it. I'll be honest, I've had a difficult time figuring out how to fit the things I like to do, like fashion design. Seeing that it's only been a couple of months, I'm not too worried about it now. But I hope to work on this. Thanks for reading my first post! I'll try to incorporate both fashion design and medicine!